Competition to lead the Fourth Industrial Revolution is fierce. Governments and firms across the globe are engaging in legitimate - and illegitimate - acts to get a foothold in a particular technology, to pioneer commercial application, and to gain share in new markets. Advanced economies, which for many decades have pushed the boundaries of technological development, are now joined by China and other emerging countries. As we progress towards a more "multi-polar" technology world, commercial friction has increased, taking centre stage in the trade arena. While some disputes around technology transfer and intellectual property are long-standing, recent unilateral action to respond to such tensions risks disrupting trade and investment flows, and straining the multilateral trading system. At the same time, it erodes the business environment for innovation progress and increased productive economic activity. To sustain a global trade system which enables continued technological advancement, differences are more effectively solved by negotiation and conflict resolution, anchored in rules-based frameworks, as argued in the World Economic Forum's Future Council on Trade & Investment note 'Trade Rules for the Global Tech Race'. The US and China are at the centre of the debate. In March 2018, the US' unilateral investigation under Section 301 of the Trade Act of 1974 found fault with alleged Chinese investment restrictions to force technology transfer; discriminatory technology transfer licensing processes; policies to support investment by Chinese firms in US businesses to obtain cutting-edge technologies; and cyber intrusions and theft. Escalating trade frictions unnerved investors, rattled financial markets, disrupted supply chains and alarmed farmers and consumers. Were the US and China to move ahead with the unilateral imposition of tariffs - above WTO bound rates - further damage could follow. The world’s two major economies would be taking trade dispute resolution into their own hands. Others could soon be tempted to copy them. With no global parameters to determine when the point of conflict has been successfully addressed, the battle could drag on. There is a view that trade actions by the US and China are really aimed at increasing their respective leverage for sealing a grand deal of mutual interest. In April 2018, China announced plans to open up its economy further, including by lowering tariffs on cars, accelerating liberalization of financial and insurance services, creating a more attractive investment environment and strengthening protection of intellectual property rights. 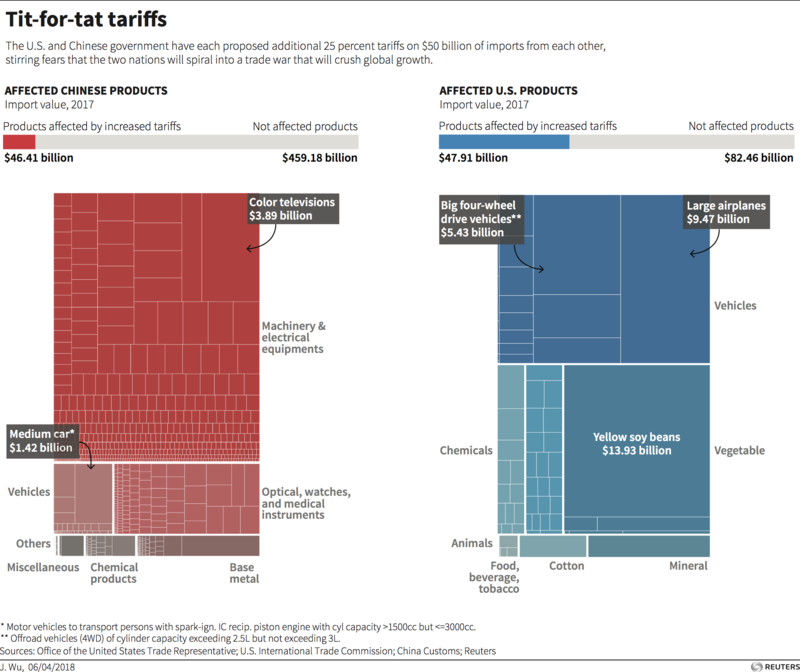 Furthermore, following high-level talks between the two governments in May 2018, China committed to expanding its imports of US goods, mostly farm and energy products, while planned tariffs linked to the Section 301 investigation were put on hold - though that course had been reversed at the time of writing. Unfortunately, continued trade frictions are likely in the short term, even if bilateral patches are found, and broader talks would take time. It is the way to go, however. The alternative is not only ineffective in the long term, it is dangerous. Tensions around trade and technology risk spilling into other areas. In explaining the importance of the Atlantic Charter - the genesis of the multilateral trading system - Winston Churchill highlighted the peace and security origins of the system: "it is not in the interests of the world that any nation should be unprosperous or shut out from the means of making a decent living for itself and its people by industry and enterprise". This is as relevant in the 21st century as it was in 1941.